Local speedway coupe driver, Mark Daub, or better known as Amber’s dad to his friends and family, can’t get enough of old cars and the speed on the race track. He is known as Amber’s dad because his daughter Amber Daub has been well known at the track for some years. “I have been at the track since I was little and everywhere we go my friends would come up to him and say, ‘Oh you’re Amber’s dad.” So they just know him as that,” she said. Mark has been a big fan of racing ever since he was 10 years old. At that time, he just could not get enough of drag racing. 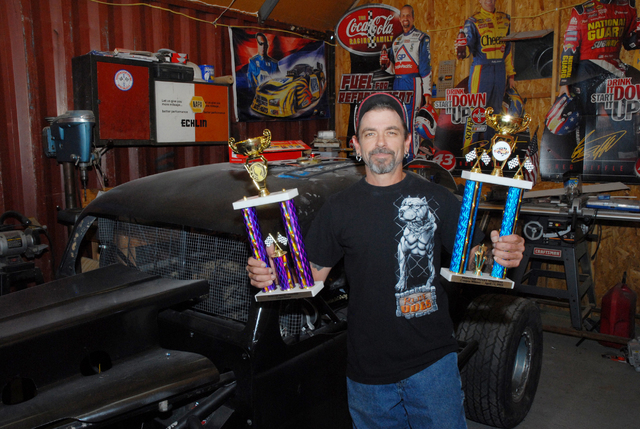 “I have been into hot rods, street racers and drag racing for a lot of years,” he said. 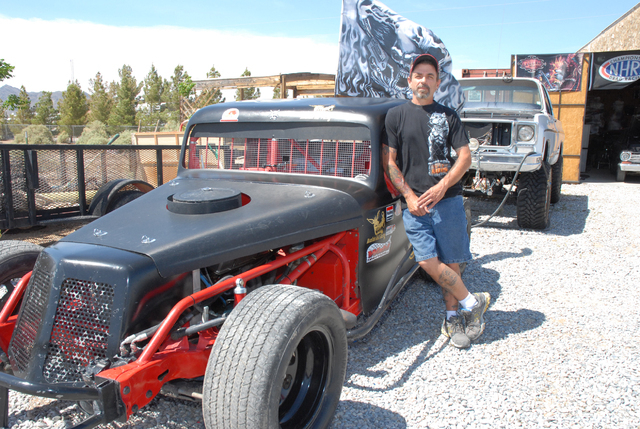 He moved to Pahrump 10 years ago and fell in love with the dirt track at the Pahrump Valley Speedway. “We met a lot of nice people out there and decided to get into the racing and last year we were able to finally get into it financially,” Mark explained. Amber’s dad is racing in the Coupe Division at Pahrump Valley Speedway. He loves racing on the dirt track as opposed to drag racing. “You have to have a lot money to go fast in drag racing,” he said. “These classes here are pretty much budget classes that you can easily get into rather cheaply. What I like about the difference between circle track and drag racing is you spend a lot of time for a 12-second run in drag racing, but for the dirt track I spend all week getting my cars ready for the race track and we are out there five to six hours. The difference is we get to race twice that night and it is a bit more fun,” he said. Amber loves what racing has done for her dad. “Honestly it’s the only thing that I have seen that makes him happy. The way his face lights up when he wins is priceless and he is just so happy,” Amber said. Mark believes dirt racing is different than anything he has ever tried and because it is different he is still learning how the car drives and how to set it up. “I bought my car from Donnie Berger, who is a great builder. He knows how to build these cars and he really knows that track. So I really listen to what he says. He is a proven winner with a proven car. I am not changing a thing. I am running it the way he has got it. I am learning. It is all about setup and not about horsepower. If you got full throttle and brakes, you have to learn how to use what’s in-between. Dirt tracks just can’t handle full throttle and brakes,” he said. For Amber’s dad, it’s any kind of racing that floats his boat. He has fun with quads, sand rails and even boats. He likes anything with speed and horsepower. The Coupe Division is more his speed than Modifieds. He thinks no one really wants to hit each other in this class and he said the class has cleaned itself up since last year. The nostalgic look of the coupes attracted him to the class. He said he would rather lose a race than “put my car into to the wall just to take someone in the corner.” Racing to dad is all about fun and spending time with his wife and daughter who both enjoy the sport as much as he does. Mark also likes the limitations put on the class so it’s easy to keep a lid on expenses. The coupe class limits the drivers what they can put into the engine. The class starts with a 305, a small block Chevy, and according to Mark you can punch it out twice (boring out the cylinders) which gives you 315 cc and this is the max. There are also limits to the size of the pistons you can use. Daughter Amber spent years selling raffle tickets at the track. She loved racing so much that she took a job with Auto Zone and works in a store in Las Vegas. Daub and his daughter have not missed a drag race in Las Vegas since the speedway opened its doors. Amber has the racing bug just like her father and has been working on cars since she was a little girl she said. She tried to race in this year’s Powder Puff Race. “I will not be racing in the Powder Puff because I was not able to find a car in time, but I am building a Mini Stock right now and it will be ready for next season,” she said. Mark said his daughter can work on engines too and has no problem getting her hands dirty. “Dad has taught me everything I know. I work as a manager in Las Vegas for Auto Zone. I have always been the only girl who knows what is going on. I pride myself on knowing a lot and this has been because of him,” Amber said proudly. He does his own work and can work on everything but transmissions. He is a self-proclaimed-backyard mechanic and is proud of his abilities. He even has a paint room to paint his own cars. He said his daughter likes helping him out whenever she can. “I always like doing things on my own and if I can’t do it I will learn how to do it. I do a lot of things because I don’t like paying someone else to do it. There is no reason to pay someone if you got the will to try,” dad said. Amber is also his crew chief whenever he takes his car onto the track. Fixing cars is now a full time job for Dad, who is a retired landscape contractor. He now flips cars for a living and is working on a 1963 Chevy Nova SS.